Pushing your refrigerator too close to the wall is a mistake. 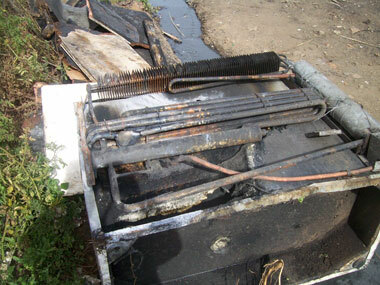 Fridges keep cold inside but their rear panels are hot. They need space for ventilation like all appliances with heated or moving parts. 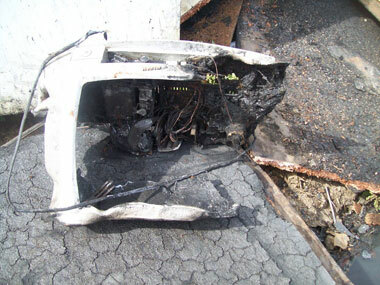 Even turning a gas fridge off at night in winter doesn't prevent hot panels from heating flammable materials nearby. And if your home is a small shack where more floor space needs to be made at night for four adults to sleep, then furniture gets pushed right into the corners. For a shack built of glue-impregnated wood fibreboard with only a corrugated iron roof, it is more flammable than ever. Lungelo Chiliza (37) is lucky to have survived the gas fridge explosion in the early hours of this morning. The gas cylinder was turned off but there was enough gas left in the pipe to explode. He and his three younger brothers Zanele 21, Thokozani 23, Mtobisi 24, escaped unscathed, but the unemployed siblings lost all that they own. 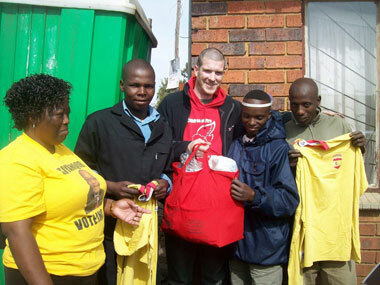 Recently-elected ANC ward councillor Pam Sibanyoni phoned Children of Fire for help. Within two hours of the call, the charity was at Dorren Road, Kliptown, with disaster recovery supplies including clothes, wash things, food, saucepans and blankets. Recently arrived from the UK, disaster management graduate Stephen Bassett (32) said: "I am proud to be an UMashesha volunteer who can respond quickly when people are in need." "These young men are very fortunate to be alive." UMashesha Abegail Ximba (28) said: "Please don't cover anything that needs ventilation. Don't put cloths over televisions or computers; keep your fridges away from walls. Think safety all the time."